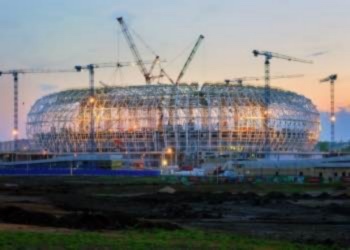 Of all of the stadiums being built ahead of the World Cup in 2018, the construction of the Rostov Arena probably has the best story attached to it. That’s because the construction, which began in 2013, was brought to a halt when five perfectly preserved shells from World War II were found in the area where the foundations would be going. 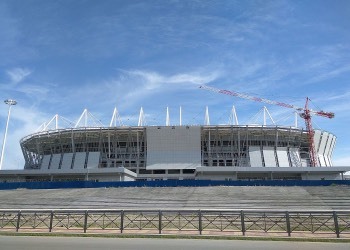 Development of the stadium was delayed until the following year, but obviously it mean that the official opening of the ground was delayed by some time. 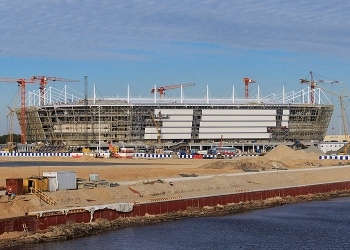 Whilst the ground will obviously be one of the official stadiums used for the FIFA World Cup, it will also be a replacement for Olimp-2, the main football ground in Rostov-on-Don that opened in 1930. 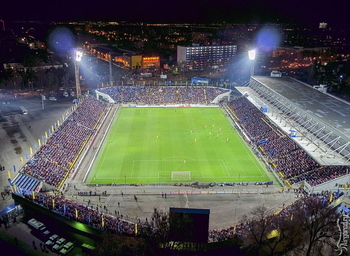 That is the home of FC Rostov and the Russian Premier League club will move into the Rostov Arena after the tournament has run its course. 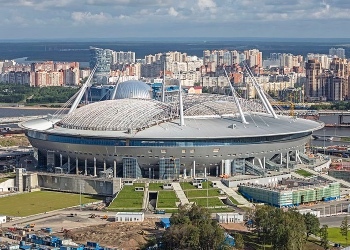 It will be the first ground that they will play their games in other than Olimp-2, given that the club was formed in the same year that the stadium opened. 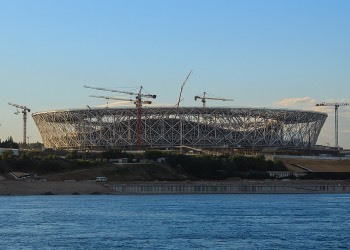 The stadium will have 45,000 seats, but around 5,000 of those are temporary. The majority of the ground is built in a bowl of continuous seating, with the exception of one of the corners that has seats missing in order to allow in natural light. Train - Getting the train from London to Rostov would take over two days. That’s not to say the more adventurous amongst you won’t want to do it, but an alternative method might be preferable. 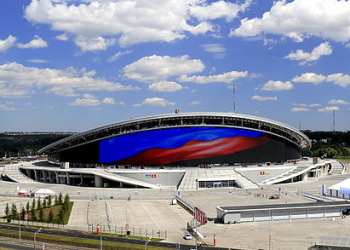 There’s a Light Rail Station named Bratskiy Pereulok that’s about forty-five minutes on foot from the Arena, which is the closest at the time of writing. Bus - If you’d rather get the bus then the 39 is the one on the local line that will take you the closest. There’ll likely be special services during the World Cup, so keep your eye out for them or have a chat about with a local. Car - The Arena is on the Southern side of the River Don, with the A135 being the best main road to take if you’re driving. It can be tricky, though, so consider getting a navigation device if you want more specific directions. By Air - Rostov-On-Don Airport is the closest to the city centre, so that’s likely where you’ll be heading to if you’re flying into Russia. Taxi - A cab from the centre of Rostov-On-Don out to the Arena will cost you about 120 rubles and will take in the region of fifteen minutes to complete its journey. 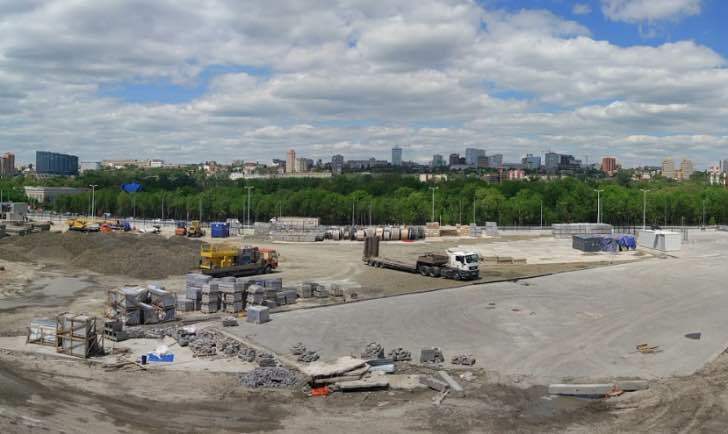 There’s no confirmation of how much parking will be available at the Arena just yet, but the beauty of being able to build a venue entirely from scratch means that you can do pretty much what you want. It’s likely that there’ll be a decent amount of parking close to the venue even if not actually part of the venue itself. The Don Kihot is a pleasant three-star hotel with just under ninety rooms. It’s a ten minute walk from the Rostov Cathedral and features both a restaurant and a bar. There’s a 24-hour business centre on-site that contains a conference suite, plus there’s free Wi-Fi in the hotel so that’s ideal if you’re hoping to get some work done whilst you’re away. There’s also free parking outside the hotel for those of you that are thinking about getting a car whilst you’re in Russia. If you want to stay in a slightly more classy venue then the Hermitage Hotel might be what you’re looking for. The four-star hotel has just over thirty rooms as well as a restaurant and a bar area. You can get breakfast in the restaurant if you want to and there’s a conference space if you plan to have meetings whilst you’re away. There’s free Wi-Fi for those of you that will be taking your computer away with you, plus free parking for anyone in a car. If you’re not overly keen with either of the other options on our list then you could always lump for a chain hotel. You’ll know what to expect from a Mercure if you’ve ever stayed in one of the brand’s other hotels, with the one in Rostov-on-Don containing just shy of ninety rooms. There’s a restaurant, a bar, a fitness centre and three different meeting rooms. You’ll get a buffet breakfast included in the cost of your stay, plus there’s free Wi-Fi and free parking. Liverpool as a city is famous for any number of reasons, though the two most obvious are the success of the city’s major football club and the way The Beatles changed music as we know it. It makes perfect sense, therefore, for a sports bar to be named after the Fab Four. It doesn’t make quite as much sense for that bar to be in Rostov-on-Don in Russia, but that’s the way it goes. As you’d expect, there’s loads of Beatles memorabilia on the walls, plus there’s a big screen that alternates between playing their live recordings and showing football matches. The food is typical pub grub and you’ll be able to get pretty much whatever drink you want. Cheshka is a pub that is all about the atmosphere, thanks in no small part to the fact that it’s got its own microbrewery attached. After all, being able to drink three different house beers will be enough to get everyone up for a laugh. The food has a German theme to it, including the likes of pork knuckle with potatoes and sauerkraut. In terms of sport, you’ll be able to watch both football matches and athletic meets, plus anything else that the owners or managers think is worthy of your attention. You’ll be able to see it all on the numerous plasma screens that are dotted around the place. Pinta is actually a chain of sports bars, so you might see a couple of them dotted around the city. They’re something of a budget chain, so cheap food and drink is the main thing on the menu. They all feature large rooms with huge screens and the likes of pool and table football tables, so in terms of finding something to do you should be fine. The food is delicious and the drinks are wonderfully varied. We’re talking about the likes of gin infused with raspberries and homemade lagers. The key thing is the sport, though, and this is the number one place to head to if you’re wanting to watch as many live events as possible in a brilliant atmosphere. 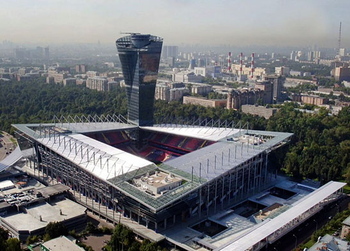 Far be it for us to suggest that FIFA is full of fat-cats, but it’s certainly true that they have specific rules regarding the hospitality sections of stadiums that are being used to host official tournament matches. 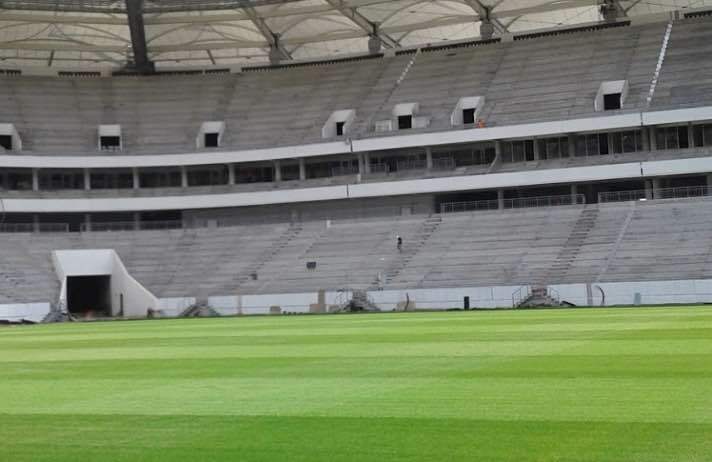 Safe to say, therefore, that there will be plenty of nice areas within Rostov Arena if you like to watch matches in style. Those hospitality sections won’t just be useful during the World Cup, of course. They’ll also be handy for businesses and private individuals that want to host events or meetings within the Arena in the aftermath of the tournament. We’ll let you know more about that once the information becomes clear. 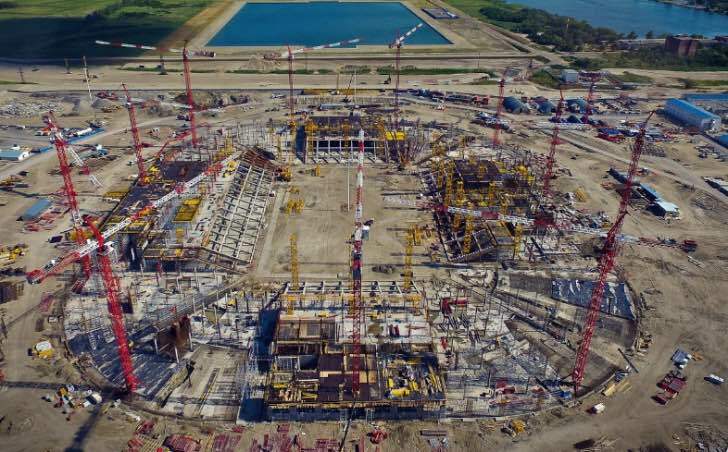 Details about whether or not there’ll be a museum on site or if you’ll be able to do a tour of the stadium probably won’t be released until after the World Cup is complete. We’ll update this section accordingly. 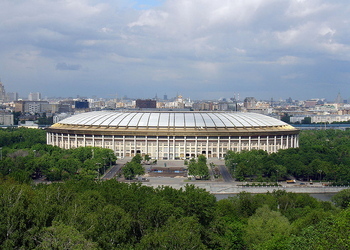 Rostov Arena doesn’t yet have a history to speak of, given that its doors haven’t even opened at the time of writing. 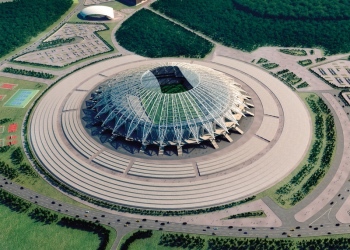 The original design for the new ground was created by Populous, the global powerhouse in architecture that is best known for its sports stadium designs. 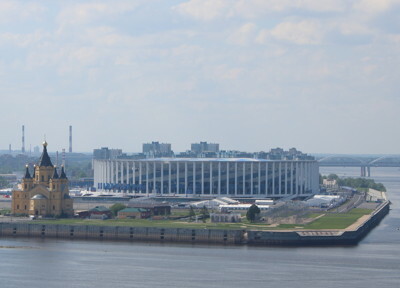 The hope is that the stadium will be more than just a football ground in the days to come, with the aim being for the area where the Arena is being built to become the centre of Rostov itself. Shifting the city centre is for the future. 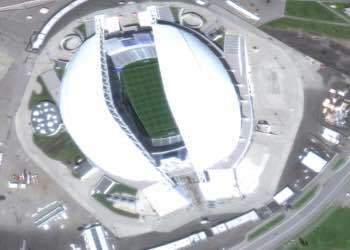 By the time that’s the case the World Cup will be done and dusted, with Rostov Arena having hosted five matches. 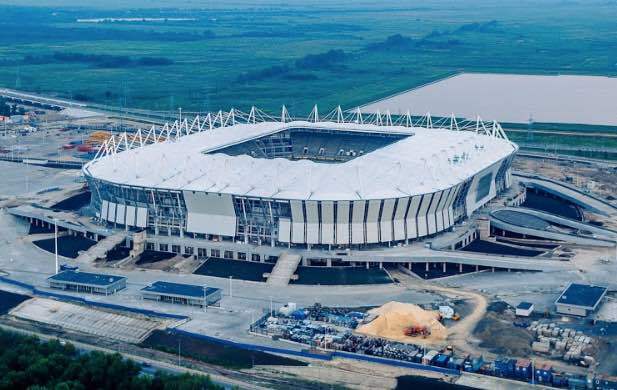 That will include a Group A game, one from Group D, another from Group E and the final Group Stage game coming from Group E. The stadium will also play host to a round of Sixteen game between the winner of Group G and the runner-up of Group H. We could tell you about the various stages of building the ground but, with the exception of finding the bombs that we mentioned in the intro, not much exciting has happened to date. 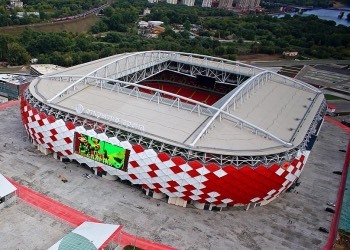 As we’ve just mentioned, the aim in the long-term is to shift the entire city-centre of Rostov-on-Don to the location of the stadium. 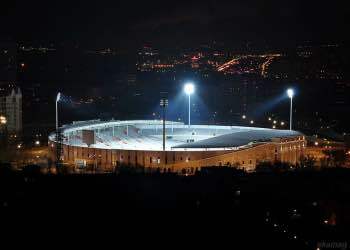 Before that happens the stadium will be reduced from having 45,000 seats to around 40,000. In the shorter-term, though, the developments will be about nothing more than finishing the building plans.